BRELOMATE was recognized at this year’s Karl Ritter von Ghega Innovation Award Ceremony of the Austrian Economic Chambers and the Government of Lower Austria for Certification of Approval amongst academic innovations. 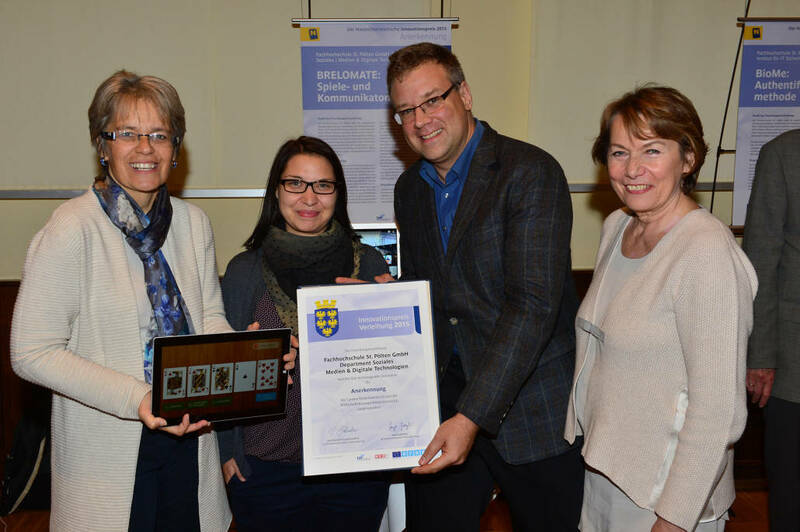 Johannes Pflegerl and Sabine Sommer presented BRELOMATE at the event and accepted the certificate on November 10, 2015 at Grafenegg Castle on behalf of the entire research team. The certificate of recognition reflects our interdisciplinary efforts at St. Poelten UAS to develop a technologically innovative and need-oriented product to foster social inclusion of the elderly. Last month we have launched our follow-up project BRELOMATE 2 to develop a television set combined with a tablet into a user friendly and inexpensive centerpiece of an information, communication and gaming platform for elderly people.